By reducing evaporation, COVERfree reduces the heat loss from your swimming pool. It also reduces water evaporation from the pool lowering the amount of water that needs to be replaced into the pool. Unlike other liquid pool cover products that require daily dosing, COVERfree only requires dosing once per week on normal domestic swimming pools. The weekly dosing required by COVERfree results in around a 65% reduction in the amount of liquid pool cover required. This reduces the running cost of using COVERfree by around 60% considerably compared with other liquid pool cover products. COVERfree does not contain any alcohol, is biodegradable, PH neutral, non-hazardous and has been independently safety tested. (COVERFree is NSF certified). It has a unique patented polymer based formula that remains in the pool for longer reducing the amount of liquid pool cover required. It can be used on all types of swimming pool including indoor pools, outdoor pools, hot-tubs, natural swimming pools, infinity pools and commercial swimming pools. 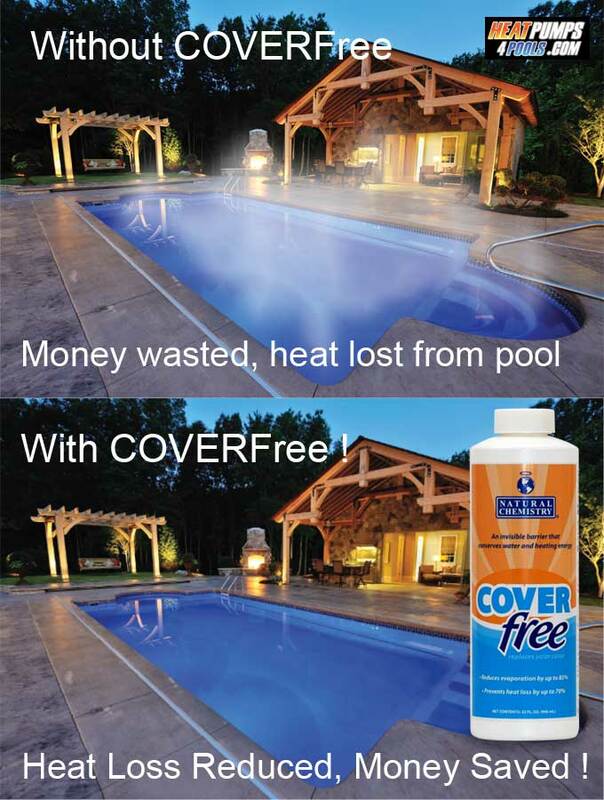 Dont waste money - use COVERFree to reduce heat loss and water evaporation from your pool !